I was a 20-year-old student studying in Florence the first time I had Italian food. After 4 months of gorging, I moved back to America. At 24, I moved to Rome and had Italian food again. Oh, by the way, I grew up going to Italian restaurants and had many Italian-American friends with mama’s constantly cooking up a storm. Now, I understand your confusion. “Didn’t she just say she had Italian food for the first time at 20?” You’re not reading this wrong. As an American, we are constantly presented with spaghetti with meatballs, pizza with stuffed crust and toppings galore, and fettuccine alfredo (to name a few). Don’t hate me or sue your local Italian hotspot, but they are feeding you lies in the most literal sense possible. I do not have Italian heritage so the next statement is not fueled by arrogance or pride- in the battle of Italian food vs. the rest of the world, Italy almost always wins. This is just the unquestionable truth found from countless taste tests resulting in many food naps. 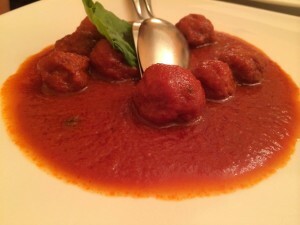 Below you will find some shocking, possibly heartbreaking, but mostly interesting realities on the Italian food that you’re eating wrong in the Italian-American mythology. The good news is both of these Italian-American staples exist in the true Italian culture, just as separate showcases. Spaghetti with a tomato sauce will be your first course, and then you could be served the second course with a red sauce over meatballs. Some Italians take this stereotype in different ways. Some simply laugh and find the kitchen translation funny, while others are genuinely horrified and can’t imagine a world where spaghetti even touches the meatballs. So there you have it. Don’t expect an Italian family in Italy to start Sunday lunch with this dish, and absolutely run from a restaurant on your travels in Italy if you see it. Telling my Italian friends about this menu item has become one of my favorite expat encounters. This isn’t even one of those guilty pleasures that you tend to hide from other people but secretly chow down on. In the simplest way possible, this is not, and will never be, Italian. 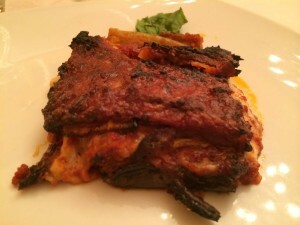 There’s no denying that it can excite your taste buds, but if you want to excite the local Italian on your travels, it’s best to omit this detail of your past food diary. 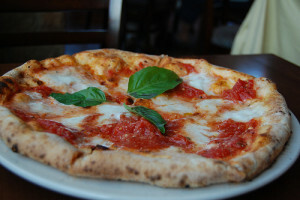 Ever heard the expression, “if it ain’t broke, don’t fix it?” This rings true for Italian pizza. Like in all aspects of Italian food culture, simplicity in key. So, in authentic restaurants, or lucky homes, you’ll find the majority of people savoring a margherita pizza- good quality mozzarella, fresh (not canned) tomato sauce, and a fresh basil leaf. If you want the pepperoni you can order at Pizza Hut or Papa Johns, order spicy salami or sausage. You won’t find the American pepperoni anywhere in Italy. Helpful hint on the menus- if you see peperoni it is the Italian word for peppers ;). And please don’t cause your Italian restaurant staff unnecessary angst or harm by asking about a stuffed crust. This may be the most wrongly interpreted Italian dish outside of Italy. Living in America, I saw all kinds of attempts—fried egg on top, made with cream, heavy garlic, crispy American bacon, the works. Tell this to an Italian and you will inevitably hear some strong language. Even as a vegetarian, I often order this classic dish because the real way is just so darn irresistible (my friends are always grateful for the extra side dish of pancetta that I give them). In Italy, cream is never, and I mean never, used. Although different regions, or even different chefs, battle over which is the most authentic recipe they all agree on that fact. So join us and take a vow never to eat carbonara with cream again! Parmigiana is made with eggplant, tomato sauce (homemade of course), fresh basil, and cheese (typically Parmigiano Reggiano and mozzarella). No spaghetti and no meat. This is true for any main meat and pasta dish- meat is not a condiment in Italy and pasta is not a side dish. Keep them separate and you’re halfway to being an Italian. In short, this doesn’t exist in Italy. 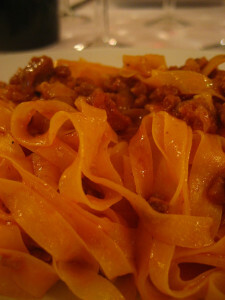 What you’re looking for is Tagliatelle col ragù alla Bolognese. In Italy, the shape of pasta makes a difference in the taste, absorbance of sauce and flavor, and standards. So, seeing this famous sauce served with spaghetti has been said to be a sign of mediocrity and inexperience. This is another dish that has had so many international interpretations that it is hard to justify just one name, but it is safe to say that if you have only dipped your fork in a Bolognese outside of Italy, you haven’t tried the real thing. If you have time in your travel schedule in Italy, go to Bologna where it originated. The taste will be with you for a lifetime. So there you have it. Instead of broken hearts and shattered dreams, I hope you have open eyes and a driving curiosity in the authentic Italian cuisine and what makes this great country so passionate about what they put on their plates. If you have any foodie enquiries, feel free to contact us via our social media channels, we’d love to help you eat well! 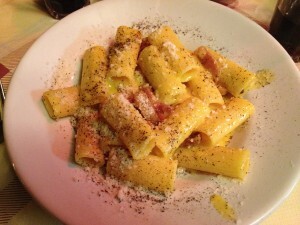 Or better still, you can enjoy Rome’s delicious cuisine with one of our food tours in Italy.